Michael Mann's climate reconstruction of the past 1,000 years that created Al Gore's famous "hockey stick" hid the fact the 20th Century tree ring data did not match the temperature data. The tree rings indicated temperatures went down in the 20th Century when the thermometers indicated temperatures rose. Here is a graph from Anthony Watt's blog showing the tree ring temperatures declining in recent years. 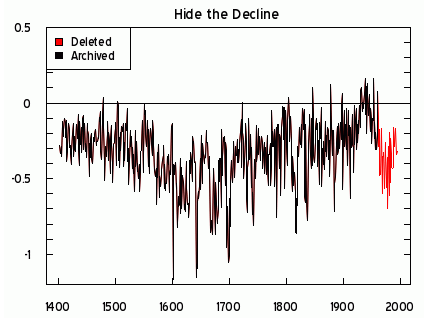 This is the famous "hide the decline" from Climategate. If the tree data was truly representative of temperatures, the tree ring data would have shown increasing temperatures. So, the "divergence" of the 20th Century tree rings from the thermometer data obviously called the entire exercise into question. Rather than simply disclose this, they made the decision to splice the temperature data onto the tree ring data. 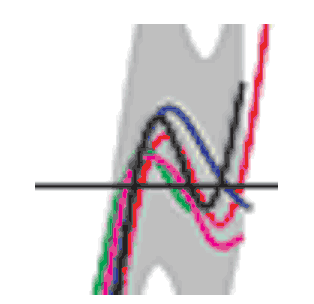 declining temperatures (multiple lines) and spliced in the thermometer record (red line). With that lengthy introduction, here is the bottom line: This is apparently accepted practice in academic research. I had no idea. There are discussions at the blogs of Roger Pielke, Jr. (see comments) and Bishop Hill. It has created such a controversy that Roger has created a second post on the subject. Roger and I have been friends for years and I know him to be a person of integrity. I take him at his word that this is common practice in academia and that, he says, it is justified (rationalized?) because they are working in "speculative" fields and endeavors. However, from my perspective, when these scientists (who I believe crossed the line from "scientist" to "advocate") advocate spending literally trillions of dollars based on their research, they should held to the highest standards of disclosure and integrity.